Do you have a sweet tooth? So many people do, and sweets can be a real downfall when it comes to sticking to your New Year’s resolutions. There’s no need to feel deprived when you can simply make friends with your cravings instead. Life is to be enjoyed. Just remember that when you crave a bit of something sweet, creamy or tart, it’s probably better for you when you make it yourself. Pretty, simple, and even elegant, poached winter fruit can be turned into parfaits, tarts, mousses and more. They can even be added to your favorite brownie mix to make it moister. Catching up with friends that you missed over the holiday season? 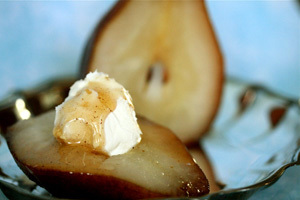 Use my delicious poached pear recipe from my latest post on AOL’s SlashFood that you can make hours in advance to show off your kitchen skills and good sense when it comes to eating well.